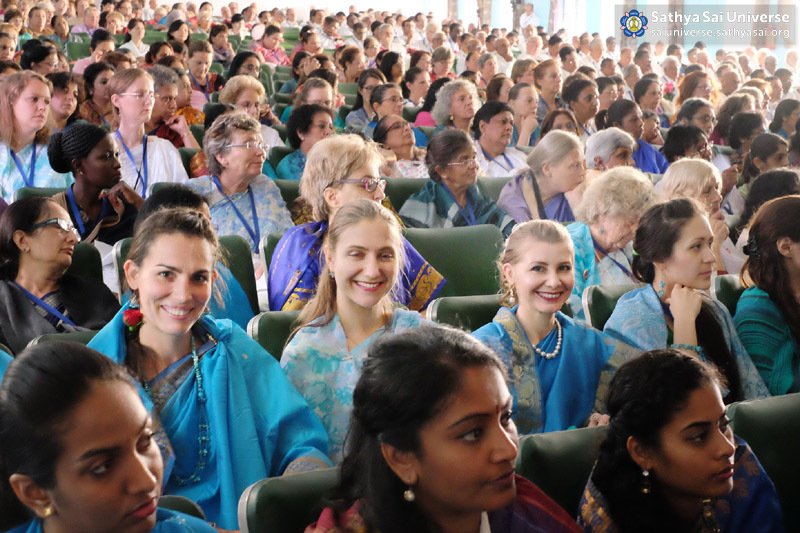 On the final day of the 10th World Conference, the keynote speaker was Ms. Marianne Meyer, member of the Prasanthi Council. She emphasized the need for intensity in love to raise our consciousness and reminded everyone that Constant Integrated Awareness is the goal of our life. Mr. Manfred Mueller-Gransee from Germany contrasted the traditional principles of business management with spiritual management, and explained how he implemented the five human values in his business. Mr. H.J. Dora, director of the Sri Sathya Sai World Foundation, recounted several experiences with Bhagawan and stressed that even though Swami was an Avatar, He lived simply, serving His devotees. Mr. Fize Mohammed from West Indies, Ms. Katinka van Lamsweerde from the Netherlands and Dr. Suresh Govind from Malaysia then spoke of the Lord’s mission. Dr. Govind passionately urged all delegates to empower themselves to be worthy trustees of Baba’s mission of love. Sri R.J. Rathnakar, a trustee of the Sri Sathya Sai Central Trust, spoke eloquently about the unity of the worldwide Sathya Sai family. He reminded delegates that it is our great good fortune to participate in the Sai Mission, and graciously shared tokens of Bhagawan’s love with conference delegates. In the afternoon, workshops coordinators presented their reports, and a Question and Answer session was held to conclude the conference proceedings. The Conference Resolutions, which included 32 action items, were presented in the evening, in the Sai Kulwant Hall.